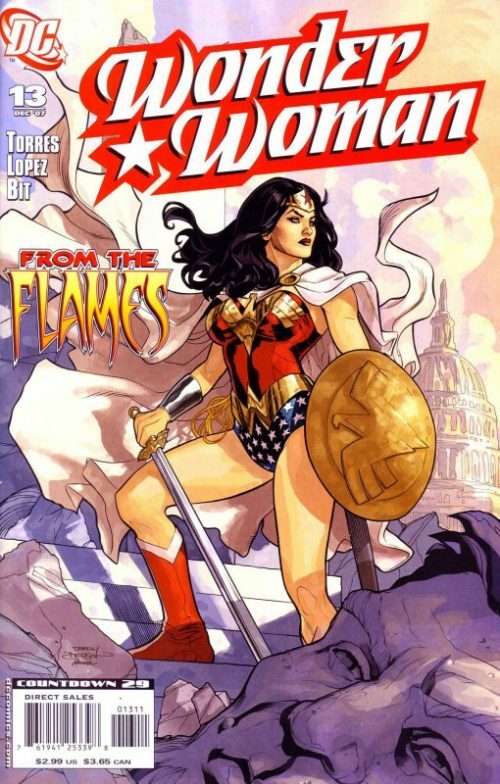 In this issue Picoult fleshes out the relationship between Wonder Woman and Tom Tresser and hints that there is perhaps a little sexual tension between the two of them. Is he the new “Steve Trevor” for the new “Wonder Woman” perhaps? We also find out why the Government is still so keen to detain the Amazon Princess, even though she has been cleared of all charges by the world Court. 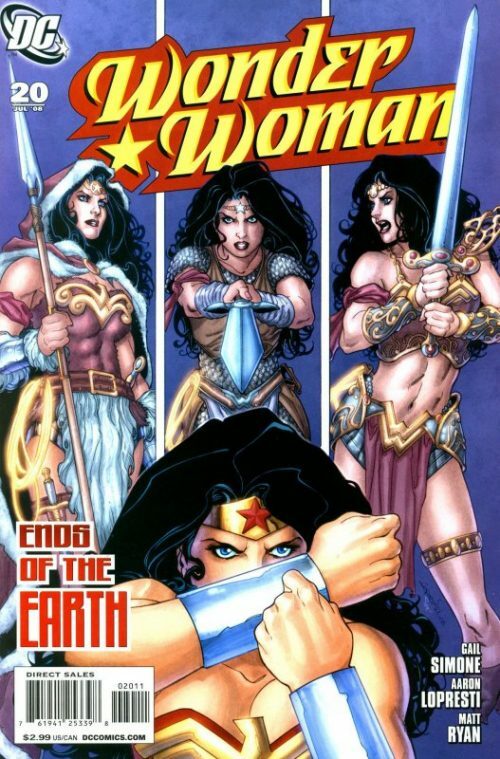 And at this issue’s finale, the return of a key character in Diana’s life is hinted at! 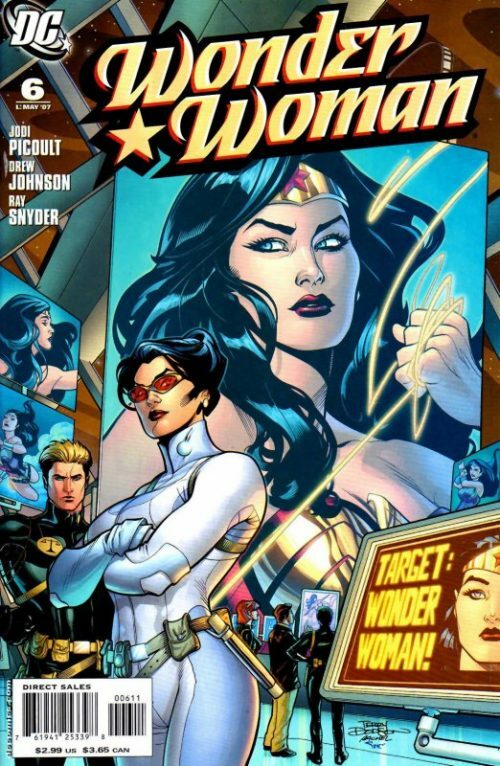 Picoult continues to indirectly comment on Diana’s character and the way she is perceived in the comic book world. 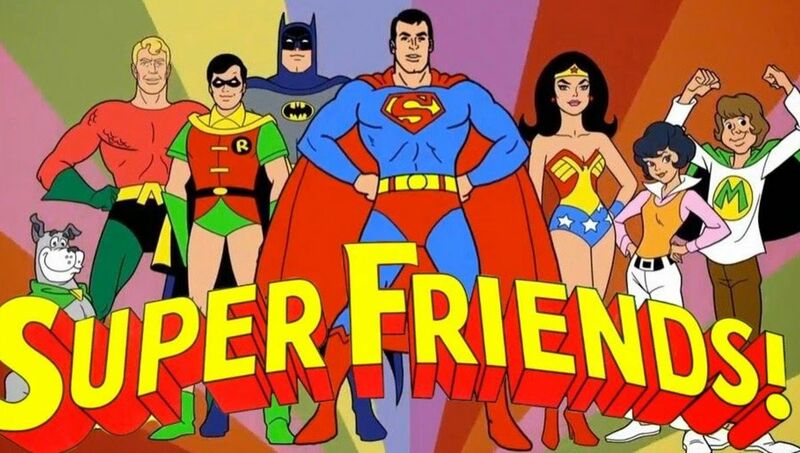 In one notable scene in a bar, someone asks the question how she can possibly fight crime in a “bikini” without it slipping off! 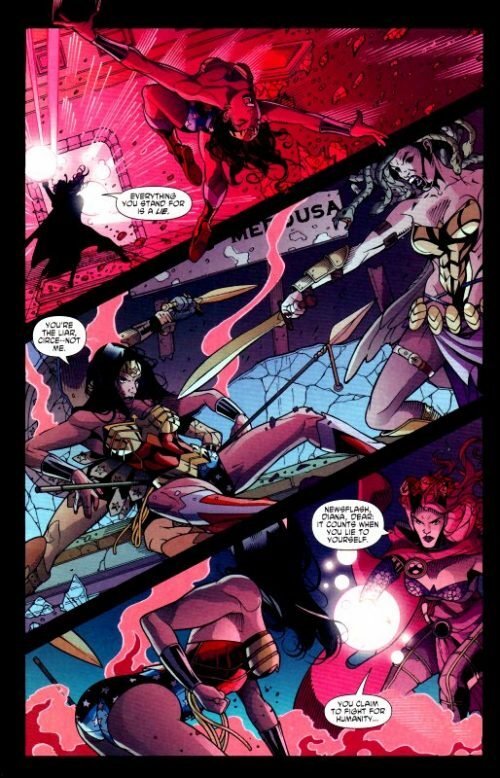 Wonder Woman enters the museum prepared for action and instantly finds herself under attack by the Witch. She is blasted across the room but is quickly on her feet again confronting her arch nemesis. She uses her bracelets to deflect another blast but finds that the magic bolt turns into snakes which rap themselves around her wrists, binding them together. She snaps them, freeing herself before pummeling Circe to the ground. Taunting the Amazon Princess by asking her whether she now intends to kill Circe, the Witch suddenly conures up a portal and escapes through it, laughing as she goes. 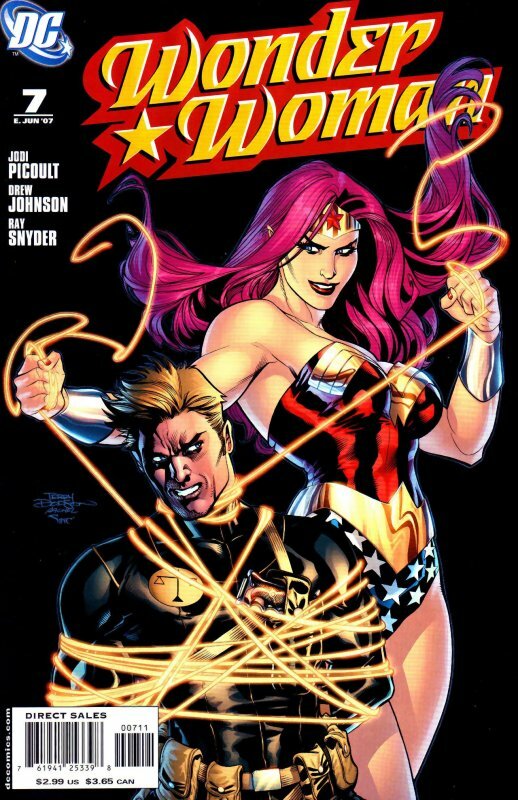 Wonder Woman then frees Tom who immediately starts flirting with her. She knows that she cannot afford to turn up at a hospital to get Tom’s wounds attended to as she is still a fugitive, so instead breaks into a Vetinary Surgeon under the cover of darkness. She patches his cuts and jokingly offers him a rabies shot. He then says that he wishes he could work with her as his current partner is ” a tool”. Puzzled, she replies that she thought he was supposed to be arresting her? As he dresses he responds that he does not always do what he is told – especially when he feels he is not being told everything. As they leave the Vets Tom explains how he had been lured to the Vixen’s Bar and carrying him in her arms, Wonder Woman lifts into the air heading for where she believes her foe can still be found. They are quickly across town and standing in the alleyway again outside the bar. Tom tells Diana that it is not really a bar for villains but fans dressed as villains. They step inside and Diana finds that the female bartender is one of her biggest fans! After he asks for her to pose for a photo she asks where she can find Circe. He indicates the washroom at the rear and she tells Tom to wait while she goes inside. She is greeted by another blast from Circe who continuing her war of words, taunts Diana as to how she is like a human in some way – liking to think she knows herself when she does not – in fact, does she even know who she wants to be? Again Circe escapes through another portal leaving Diana in the washroom. Suddenly she hears her name called and turns to see Sarge Steel and a dozen heavily armed troops with their guns trained on her. Steel says that they are taking her into custody as one of the troops fires an electro net over her. She replies that the net will not hold her and that they have no right to do this. He replies “You have no right to kill people”. Steel then turns to Tom and congratulates him on apprehending the Amazon. The puzzled Tresser looks back unsure what he means and Steel continues that unbeknown to Tom they had placed a tracker device in his uniform. 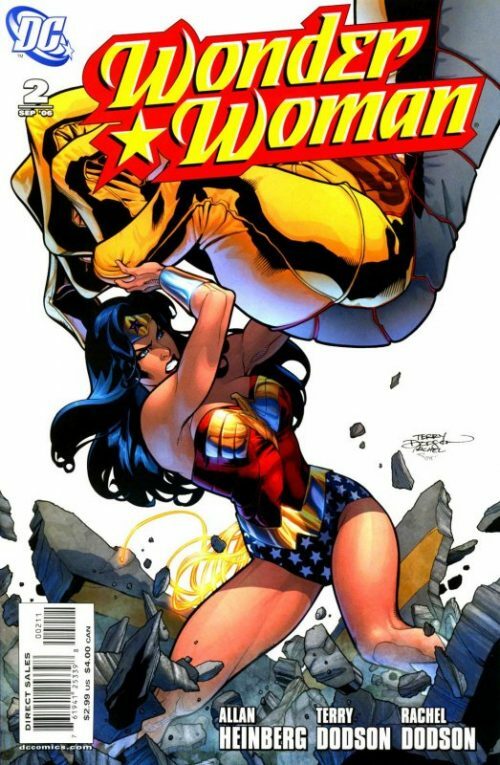 Wonder Woman then agrees to come along peacefully in order to resolve this misconception of his the sooner the better. Some time later at the Head Quarters of the Department of Metahuman Affairs, Sarge Steel shows his clearance to the heavily armed guards before taking a lift deep down into the bowels of the facility. 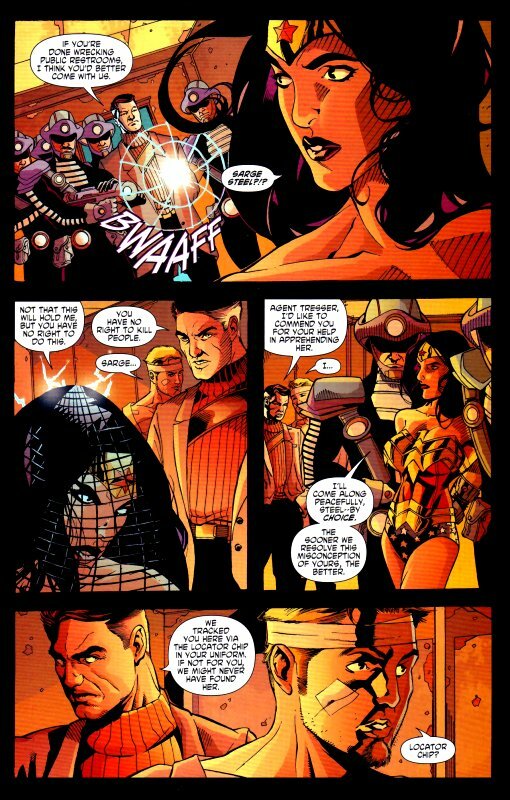 He asks the guards if Wonder Woman is secure and is told that their “operative” guaranteed it would be impervious. As he steps out he walks across the chamber to where the Amazon Princess sits inside a small transparent cell. She asks him what he wants with her and Steel replies that it is nothing personal and that he is simply doing what he is told. He tells her that in exchange for dropping any further questions about her slaying of Max Lord, the government wants some details about Amazon technology – in particular the “unfortunately named Purple death Ray” which had been used to destroy the OMAC’s that had attacked Themyscira. She refuses point blank and finds herself zapped by a powerful blast of energy. As Steel walks away he tells her that she will comply or else her stay will be indefinite! Meanwhile, in a place between dimensions, the Circe asks the Gods for permission to travel to Themyscira. She tells the she wishes to pay her respects to one who means so much to her. The Gods agree but warn that she will pay a price which they may call upon at any time. 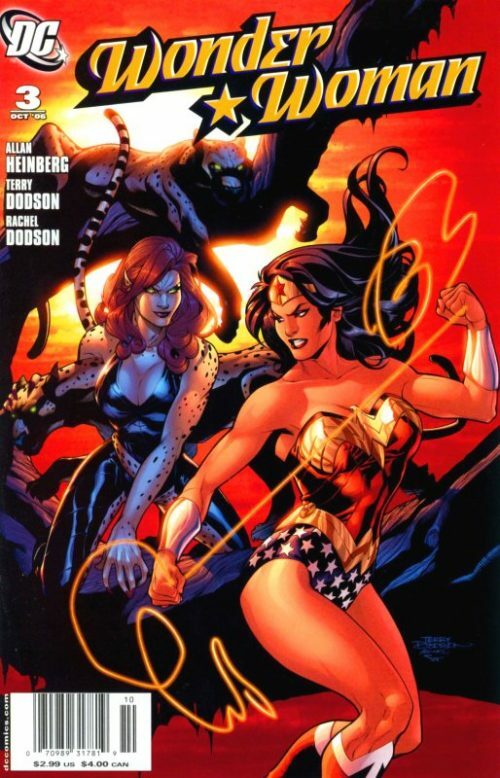 As the sun shines over the beautiful Amazon Home land, the Amazons go about their business as usual. Two of them approach the tomb of Queen Hippolyta and are shocked to see that the “eternal” flame has gone out! They know this should be impossible as it was lit by the Gods themselves – unless some hand of sheer evil caused it to die. They hear a voice behind them and turn to see Circe smiling back at them.